Starring a cunning ninja fox, Flaming Fox is a martial arts themed UK slot set on the backdrop of an animated dojo. Displaying some of his most effective moves, the Flaming Fox will influence the reels to hopefully work in your favour. Powered by Red Tiger Gaming, this 5-reel slot has 10 pay-lines on offer, although win lines pay both ways. With Burning Titles, Burning Reels, Locked Tiles, Locked Reels and Free Spins Feature, there are plenty of in-game bonuses for you to take advantage of. Enter the dojo and start spinning today. Upon entering the game, the Flaming Fox will present to you a 5x3 gameboard on the backdrop of his chic dojo. The traditional Chinese music puts you into a state of relaxation before the real action unfolds. Once you’ve chosen your stake, you’ll be ready to spin. Throughout the base game, you’ll hit several winning combinations that all consist of different symbols and values. The lowest paying symbols are the playing card icons that range from ten to ace. The medium paying symbols are the flaming boots, cat, headband, bells and symbol and ninja swords. With win lines paying both ways, keep a look out on both sides of the reel to see what symbols line up. 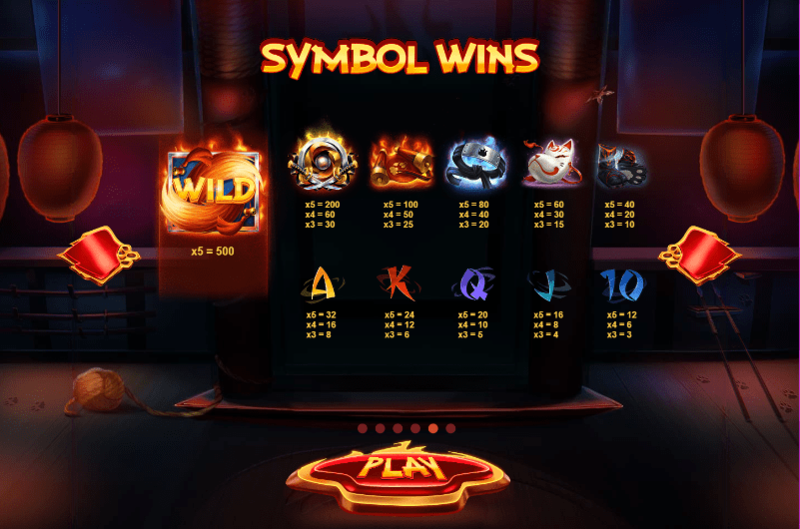 FLAMING FEATURES – When the Flaming Fox emerges from the backdrop onto the gameboard, he’ll smash away reel positions or entire reels to reveal a flaming reel set. The flaming reel sets contain only high-value symbols or WILDS. If the Flaming Fox decides to smash reel positions away for a second time, locked WILDS will fill those positions. FREE SPINS FEATURE – Hit 3 or more Flaming Fox Free Spins SCATTERS to trigger this feature. The more SCATTERS you hit, the more Free Spins you’ll receive. During the feature, if the Extra Spin symbol appears during the flaming reel set, you’ll receive additional spins. All features triggered by the Flaming Fox will remain locked for the duration of the Free Spins Feature. If you're a fan of bonuses and promo features, click find out more. Overall, Flaming Fox is a great slot full of action and potentially huge wins. Although it’s considered to be a highly volatile slot, a base game that offers the possibility of winning 3,333x your stake on one spin is worth taking a risk on. Not only that, but the base game win lines pay both ways and there is an abundance of great in-game bonus features on offer. 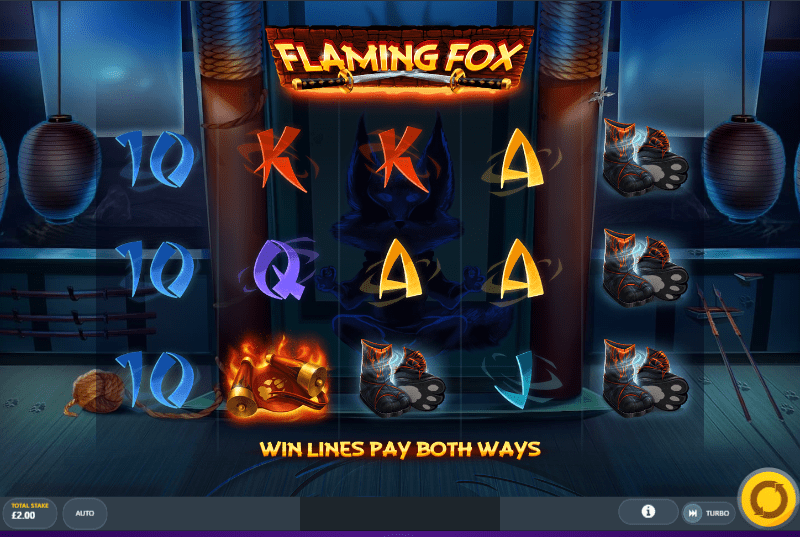 Even if martial arts isn’t your most preferred theme, Flaming Fox is simply a great online slot that you should try out. If you want to try more games like Flaming Fox, click here.